This week addresses the third topic of Part I: Digital Footprints, and Big Data. Begin this week by watching the following screencast. It is about 19 minutes long. Anyone still awake at the end of it gets extra credit. Seriously, it should help you get oriented to this vast area of digital citizenship concern, as well as to what we are doing this week: Digital Citizenship, Week 4, Screencast. What issues – both positive and negative – are associated with digital footprints and living public lives on the Internet? How does the private sector view the importance of digital citizenship? What is the relationship between digital footprints and Big Data? How do we create digital footprints? How can we manage our digital footprints? How can we create deliberate, positive digital footprints? What role does social media play in the development of digital footprints? To identify and explore the concept and reality of digital footprints, including the differences between intentional and unintentional digital footprints. To explore methods students can use to deliberately cultivate their digital footprints, including what they would like to include in their public ePortfolios. To develop an understanding of how colleges, business and the public view how we present ourselves online. To develop an understanding of the relationship between digital footprints and “big data,” and how big data creates opportunity and privacy concerns. To show our exploration of the above issues in the class conversation, and in student weekly ePortfolios. This week we will address a few related topics: digital footprints, the public’s perception of us based on our digital footprints, how digital footprints feed “big data,” and the privacy issues that result from the big data industry. For now, let’s look at digital footprints. What we do online follows us outside and beyond school. This is not news to most. But while we seem to understand this theoretically, we often don’t fully appreciate it in practical terms. Search for yourself. Most people who do are surprised at what they find. And then there is a problematic business about what other people post about you. You may be tagged in a photo, taken by someone who saw you at a party in a questionable pose, which is now on someone else’s Facebook page but searchable as part of the Internet. There is little you can do to control these eventualities. This is the new normal. All of us maintain online portfolios, (or scrapbooks or tattoos, depending on your point of view) which comprise the public face we show to the world via the infosphere. Some of these efforts are intentional, such as developing a webpage or ePortfolio. Others are simply the result of our unconscious involvement online as we as engage in commerce, education, social media and a number of other activities. The result is that it is impossible to hide on the web these days. This fact has forced all of us to engage in identity management on the Internet. The closest thing to prevailing in this environment is to ensure our most prominent work on the web is also our best work. It is routine at this point for employers and universities to check the web for the e-presence of potential candidates. We want to make sure that what they see is what we want them to see (Ohler). In fact, we want to embrace being searchable by putting our best digital footprints forward. We will continue this discussion below when I introduce the reading and viewing materials required for this week. Digital Dossier, by youthandmedia.org. I find this video particularly effective because it is youth speaking to youth, which, my years as an educator tell me, is much more effective than adults preaching to youth. Your Digital Footprint May be Unflattering. This short, NBC affiliate news story conducts a real life search for graduating seniors who are concerned about their online presences. The results are rather amazing. You put that on Facebook? A clip from an Ellen show. A funny, poignant warning. Do Not Track Documentary. This is probably one of most unique documentaries I have seen a long time. It is interactive, allowing you to input your own information to find out how you are being tracked. And it is a truly unique aesthetic experience. July 2017 Educator Toolkit: Digital Footprints by Knowledge @ Wharton High School. An assortment of Pinterest Infographics. A number of very helpful infographics that illuminate the issue of digital citizenship. George Couros’ Helping Students Develop Their Online Identify. George’s take on the importance of digital citizenship. Manage Your Digital Footprint by iKeepSafe. 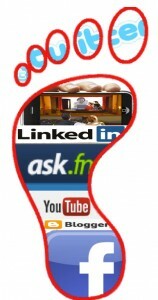 Your Digital Footprint Matters by Eric Scheninger. It features a review of tools to check on your digital footprint. Trillion Dollar Footprint, a CommonSense Media resource for grades 6-8. This is just one of a number of great CommonSense resources in this area. We will spend a week exploring CommonSense resources later in the course. Your Digital Trail by PBS. A great overview, created with typical PBS insight and expertise. Four Reasons To Care About Your Digital Footprint. I like this YouTube video because it explores how your digital footprint is tracked for commercial, criminal and political reasons. The resources above tend to address the scary end of digital footprints. But if this is our primary focus then we lose sight of the opportunities that digital footprints present. What do we want to show the world? This compels us to ask: “Who, and what kind of person, do we want to be?” This presents a tremendous learning opportunity for students to imagine their future selves. We can’t hide anymore. Even if we drove our four wheel drive vehicles deep into the wilderness, set up camp, and got off the grid, people would still blog, tweet, and Facebook about us. Therefore, we want students to create deliberate digital footprints. We want students to create a digital presence that represents themselves as their best selves. We want to seize the teachable moment. Teachers know that when students publish for an audience- rather than just produce homework for their teachers – their internal sense of expectation rises. If students need to present their best selves, then let’s help them by having conversations about who and what kind of person they want to be. Students: start collecting your best work at an early age for web presentation. “Best work” is not just school work, but also news clippings about sporting events, work in the community, playing in a band, hiking, poetry your write in your spare time – whatever you do. Teachers: my guess is that every semester your students produce at least one piece of exemplary work. Save these. Administrators and school boards: Support these efforts however you can. Parents: become part of the process by helping to save your children’s work, as well as documenting things your children do outside school. When should students go live with their ePortfolios for the world to see? This is a great question. There are understandable issues around identifying students fully, as well as around maintaining their privacy. My experience tells me that this is a decision that needs to made with parental, school and community input. I have also learned that different people feel very differently about this. Bottom line: Let’s help students tell their stories. Our students either already have an online presence, or, depending on their age, will soon. We can help them manage it and turn it into a positive presence, or we can step back and let whatever is going to happen, happen. I suggest we embrace the former. I recommend we help them create ePortfolios that they populate with their best work, their hopes and aspirations, their community involvement, and their artistic, athletic and academic accomplishments. They should begin saving artifacts at an early age, regardless of when they want to go live with their ePortfolios. We should help them do so. At what age should they go live with ePortfolios? I addressed this above, but let me know emphasize the importance of this issue again. I have found each school views this differently. I encounter everything from “My kid will never post anything on the internet!” to, “They are already on the internet, so let’s help them manage their presence from an early age.” At what age they do post their online presence is an important discussion that parents, school communities and students need to have. But you need to have that conversation. Remember: If we don’t help students tell their own stories, then others will do it for them. And they are not going to want that. They need to create and manage their own narrative. In fact, we all do. The collective digital footprint experience is often referred to as Big Data. This is the term given to a relatively new information ecosystem characterized by our ability to collect and store vast amounts data that can be intelligently mined in near real time. Mining can produce smart analyses of individuals or groups, providing a road map to guide future experiences. In education, Big Data is being used to personalize education and predict student needs. But Big Data has also generated suspicion because of its potential to commercialize student information, and create long lasting data bases that can follow people well into their adult lives. And we always need to remember that whenever we use the data we collect to predict user needs, we can limit future options. Some of the most impactful events in a student’s life can be having a special teacher, or an unexpected, inspiring experience in school or in life beyond school. These “variables” tend to fall outside what Big Data can consider. If you want to read more about the technical aspects of Big Data, I recommend reading the Wikipedia Article on Big Data. Here are a few articles on Big Data use in K12. I provided one relatively positive article, another which provides a history of how Big Data in K12 has been used and perceived, as well as the legislation that has evolved because of its use, and a report on one of K12 Big Data’s biggest failures, InBloom. The Future of Big Data and Analytics in K-12 Education, from Education Week, February 2, 2018. This provides a good overview of how Big Data is used, as well as efforts in the field. A brief history of education’s Big Data debate. This will bring you up to speed on how Big Data has evolved in the K12 environment, and the federal policies that have been developed to address concerns about Big Data’s power. There are laws on the books that might impact what a student can post. Two are mentioned below, FERPA and CIPA. Please note that these are subject to interpretation. You can read the rest of article of the article here. Some feel this has been misinterpreted to mean students should not use social media in school. For more about this perspective, read FERPA and Social Media, by John Orlando. Barrett, H. TEDex presentation. URL: http://www.youtube.com/watch?v=ckcSegrwjkA, watched 1/3/2014. Digital Footprint collage is comprised of well known social media logos for the purposes of social commentary. Ohler, J. 2013. Digital Storytelling in the Classroom. Thousand Oaks, CA: Corwin Press.